A crown is for a damaged or root canalled tooth that cannot be restored with filling. 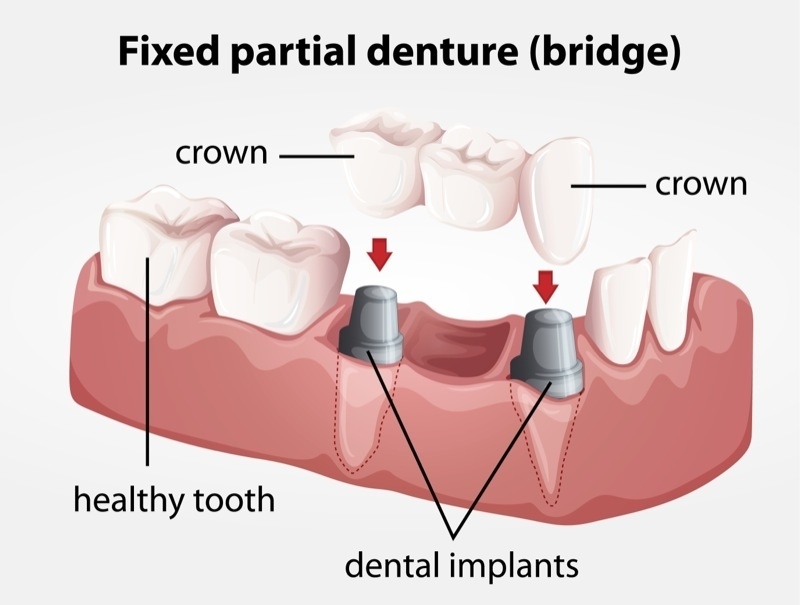 A bridge consists of a few crowns and is a solution for replacing one or more missing teeth. It is an alternative solution to dental implants. Crowns and bridges are made of Porcelain Fused to Metal (PFM), Porcelain Fused to Gold (Captek), Pure Porcelain crowns/Zirconia crowns or Bridges is for the optimal Cosmetic desiring patients. When decay is first detected in a tooth, the usual action taken by the dentist is to provide the tooth with an intracoronal restoration: a restoration consisting of a dental material that will exist totally within the confines of the remaining tooth structure. The restoration commonly referred to as a “cavity filling”, or more colloquially as a “filling”, is an intracoronal restoration, and can consist of a number of materials, including silver-colored amalgam, tooth-colored resin or gold. Inlays are also intracoronal restorations. In a situation where there is not enough remaining solid tooth structure after decay and fragile tooth structure is removed, or the tooth has fractured and is now missing important architectural reinforcements, the tooth might very well require an extracoronal restoration: a restoration consisting of a dental material that will exist around the remaining tooth structure to a varying degree. Restorations that fall into this category include the various types of crowns and onlays, and these can consist of a number of materials as well, including gold, ceramic, or a combination of the two. Ceramic crowns are increasingly being substituted in place of gold crowns for aesthetic and structural reasons. In a recent study, only 1.7% of the ceramic crowns needed to be replaced after 2 years, with 3.7% showing occlusal chipping without need of replacement. The circumstance of the damaged tooth defines the restoration. In other words, based upon factors such as remaining solid tooth structure, aesthetics, the location of the tooth within the dental arch and the consequent forces of function that said tooth will have to deal with once restored, Dr. Nader Ahdout will then decide on the proper way to treat the tooth. Things are not always straightforward when it comes to restoring a tooth. An advantage of crowning a tooth over restoring the tooth with an excessively large pin-supported amalgam or composite restoration is that crowns provide much more protection against future fracture or recurrent decay. The indirect techniques of crown fabrication translate into a more adapted tooth-restoration margin, and thus a better seal against the decay-causing bacteria present in saliva.